The Tee Square It Transfer Alignment tool helps you align and center your heat transfers quickly and accurately. 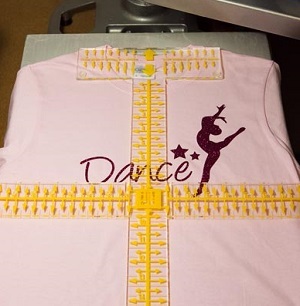 Although placing transfers on t-shirts may seem simple enough, alignment mistakes can be costly. 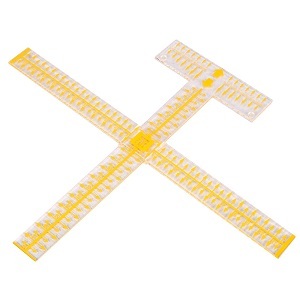 The Tee Square is easy to use and assemble with its cleverly designed translucent, ruled, horizontal and vertical crossbars at 90° angles. Now, the T-Square It offers better features to allow easier use and better results! The Tee Square It features a new collar-plate design which actually sits on top of shirt collars with rubber feet. This allows transfers to slide easily underneath. Also, the width bar no longer slides onto the center bar, but fits on on top with side rails to keep the the bar on track. This also makes the width bar easier to remove if it is not necessary for alignment. Finally, the Tee Square It offers a long, convenient center bar at 20.5" long!